As our van rumbled over the gravel road winding steadily up the side of the mountain, we saw the sun setting against the backdrop of a solitary house and the moon reflecting its light across the opposing side of the sky. 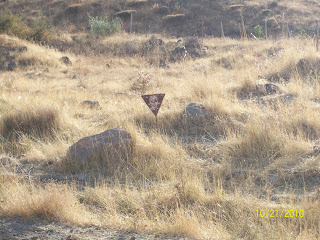 The road on which we travelled was safely situated between fields of landmines, with little skull-and-crossbone signs keeping us moving forward. Our driver parked the car outside a makeshift fence that surrounded the house, and a family of three with smiling faces met us with a warm Kurdish greeting. We had arrived at the home of Mahmud and his family. Mahmud lost his right leg below the knee after a landmine explosion on his property many years ago. The family still lives here, perils and all. It is how they make a living. They still grow some crops in areas not overtaken by explosives. They raise turkeys and other animals (although sometimes the livestock wander into a nearby landmine field and don't make it back). They have to travel back and forth between this remote homestead and the city, because their son is still in school and they want him to finish his education. No school is located in any neighbouring village. Sometimes they travel back and forth and stay in one place for months at a time; sometimes they travel back just for a quick weekend to tend to the animals and make sure they haven't wandered away. It's a difficult life, and the family struggles to make it work. Although they love it here in the mountains, they talk about the difficulty of making ends meet, of never knowing whether more bombs or military attacks will hit them, of no services being provided for families like theirs who exist on the hope of small annual agricultural crops. They tell us about the feeling that there will never be peace, not lasting peace. There will always be tension between their people, the Kurds, and neighbouring Arab, Turkish, and Iranian countries. They feel as though the violence will never stop. No one is coming to dismember the landmines, so most of the land in the region cannot be farmed. Little education is available. Farming subsidies that are commonplace in the West are unheard of here. Farmers cannot get help with crops or treatments for killing pesticides. The uncertainty of knowing whether bombing will drive them away from their home makes long-term horticultural planning difficult. Our evening was filled with the exchange of stories and music, a mix of cultures gathered on rugs covering a concrete floor. We loved getting to meet Mahmud and his family. We loved learning about their joys and sorrows. And we were all struck with the complexity of the problems surrounding the Kurdish region of northern Iraq. There has been such a history of violence and there is so much distrust. It's hard to know where to begin in an effort to promote peace and reconciliation. While the complexities can be overwhelming to us, Scripture is full of stories of God protecting his people, providing solutions to problems that seemed overwhelming. He often chose to provide this protection in really creative ways. Another story tells of God hearing his people crying out in fear against a pursuing army. God hears and takes action. When his people awake the next morning, they find that the opposing army is looking at the streams surrounding the hillside and becoming terrified because the water "appears to them as blood." They freak and run, and the Israelites are saved. They did not lift a hand, did not shed a drop of blood in the process. The Old Testament also tells many stories about God "hardening" and "softening" hearts, as in the days of Pharaoh and King Nebuchadnezzar, when he caused leaders to reject the obvious to their own peril or show great compassion leading to miraculous freedom. War reminds us of the depravity of human nature when it is left unchecked. It also reminds us how quickly we as humans forget that God is all-powerful and that the hearts of individuals, government leaders, and military commanders are ultimately subject to him. In working to undo the effects of violence or helping to facilitate the healing process, it is tempting to forget that reconciliation can only happen when God reaches down and touches lives. Any of our efforts apart from the work of God will be flawed and inadequate. The Apostle Paul, no stranger to violence, spent his early years as a religious leader, killing off Christians. He did this in the full belief that he was doing the will of God - until God met him on the road to Damascus and informed him otherwise. Paul did a 180 and spent the rest of his life being persecuted as a follower of Christ. In his letter to the church in Ephesus, he exhorts that the church accept this persecution, and reminds his fellow believers, "Our struggle is not against flesh and blood...but against the spiritual forces of evil." In other words, "If it bleeds, it's not your enemy." If we are going to "get in the way" of violence, we have to remember that our enemy is not one made of flesh and blood. We also have to remember that the only way to stop cyclical, systemic violence is through God reaching down and changing hearts. Over the last several days, as our team visited families and villages tucked away in the mountains along the Iranian border, we heard stories of how violence brought about by bombs, land mines, guns and forced displacement had forever changed the lives of the mountain people. They long for a day when they can walk outside their house to a plot of farmland instead of a fenced off field of land mines. They long for a day when they can leave a camp for Internally Displaced Persons (IDPs) and go home without fear that any house they build or produce they grow will be destroyed by another set of bombings. They long for a day when it is not their people (the Kurds) vs. other people - when it is simply their people being allowed to carve out a life for themselves without the ever-constant threat of violence. The situation here is complicated. It involves a conglomerate of ethnicities, national boundaries, religions, languages, political parties, economic challenges, urban vs. rural discrepancies and distrust between everyone. But let us not think that the situation is beyond the hand of our Almighty God. Maybe he doesn't want us to be able to boast "that our own strength has saved us." Maybe He is waiting for us to open our hands, surrender all the pieces, and be willing to respond to his creative resolution with a faith that maintains the nonviolent consistency of Jesus.